Did you know that you can even disable individual timeline clips, not just tracks? 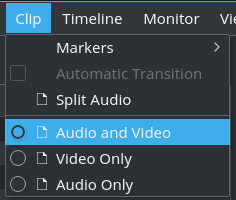 And that you can also selectively disable just audio or video for each timeline clip individually? Right click on a clip in the timeline. The clip will then be marked with a forbidden sign, next to its title. See below for a visual example. Repeat the steps above to enable this clip again. Clip > Video Only to enable only clip video. 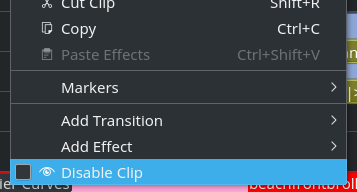 To enable both audio and video, choose Clip > Audio and Video instead.